Renovations are finished at the Hampton Inn Dulles/Cascades hotel, and the guest feedback is showing it. 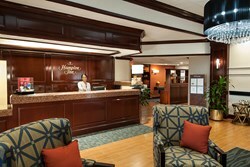 Sterling, VAs number one hotel, the Hampton Inn Dulles/Cascades, has just finished the complete renovation of its Perfect Mix lobby, business center, and fitness room. The total cost of this renovation was over $ 250,000, but the feedback so far from guests has been that it was well-worth the investment. The feedback from our guests, both on review sites such as TripAdvisor and through our guest satisfaction surveys, has been overwhelmingly positive, says hotel general manager, Rebecca Leo. The hotel was great before, but this renovation has really taken us to a new level. Nothing in the public space has gone overlooked; we upgraded everything: the lobby, the breakfast area, the business center, and the fitness center. GTECH Donates Technology to the New Sierra College Veteran’s Center in Rocklin » « Ultimate DWG Recovery Tool Released by Recovery Toolbox, a Leading Supplier of Recovery Solutions.